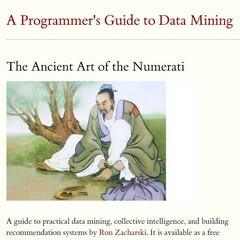 Ron Zacharski wrote:Before you is a tool for learning basic data mining techniques. Most data mining textbooks focus on providing a theoretical foundation for data mining, and as result, may seem notoriously difficult to understand. Don’t get me wrong, the information in those books is extremely important. However, if you are a programmer interested in learning a bit about data mining you might be interested in a beginner’s hands-on guide as a first step. That’s what this book provides. This guide follows a learn-by-doing approach. Instead of passively reading the book, I encourage you to work through the exercises and experiment with the Python code I provide. I hope you will be actively involved in trying out and programming data mining techniques. The textbook is laid out as a series of small steps that build on each other until, by the time you complete the book, you have laid the foundation for understanding data mining techniques. Ron Zacharski is a Zen Buddhist monk and computational linguist living in Las Cruces, New Mexico. His research centers on machine translation.